Kids are going to love this list of pumpkin books. 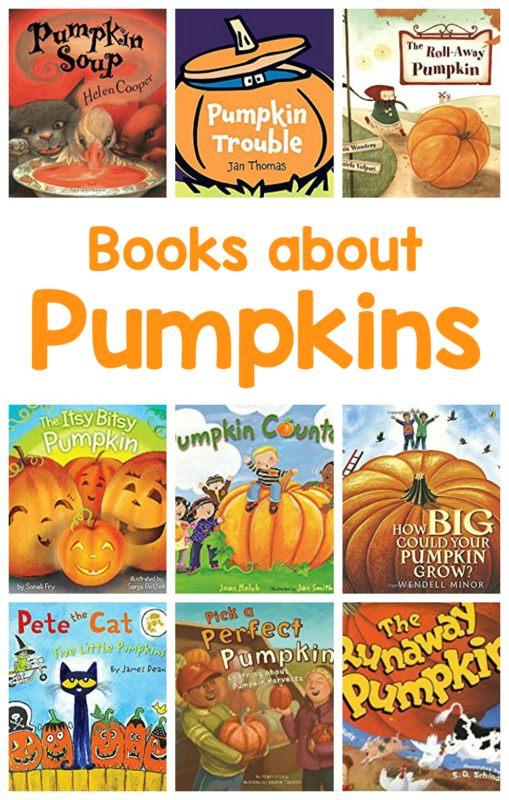 Each one is great for teaching children about pumpkins and getting kids excited about reading. With fall comes pumpkin harvesting time. This means family and school outings to local farms and pumpkin patches, as well as pumpkin decorating. Many a child is learning about the pumpkin life cycle and making plans for how to carve their pumpkins. And don’t forget the pumpkin pie! With the pervasiveness of pumpkins in autumn, it’s the perfect time to break out the pumpkin books for kids. These books are a great way to teach children about pumpkins and get them excited about the season. The Roll Away Pumpkin is a delightful book about a very large runaway pumpkin. Marla Little is chasing her roll away pumpkin through town. As it passes them, others join her in on her chase. The baker, the butcher, the milk man and eventually a large group of parade marchers all join in. The pumpkin rolls and rolls, until finally landing in an opportunely seasoned pot strategically placed in front of the rolling pumpkin by Martha. The chase party then partakes in a most delicious pumpkin soup. This is a great repetitive book and features patterns of repeated phrases that children will be delighted to join in on. The repeated words are often in different font sizes and colors, which can also be a great pre-reading tool for print recognition, letter recognition, and sight words. It’s Pumpkin Time is a great picture book to depict the life cycle of a pumpkin. It also includes concepts of plant care, patience, and pumpkin carving. In preparation for their favorite holiday, Halloween, two siblings plant a pumpkin patch together. We follow the children through the process step by step. They turn the soil, make rows, plant the seeds and water them. The seeds grow to sprouts and then vines and they begin to flower. As it gets closer to fall, the flowers turn to pumpkins. When the pumpkins turn orange, the children know that they are ready. They use them to carve jack-o-lanterns with their parents. Pumpkin Soup is a beautifully illustrated rhyming book about three animal friends. Duck, Cat and Squirrel live together in a white cabin in the woods. They especially enjoy making music and pumpkin soup together. They share the duties and everyone happily does their assigned job. That is, until Duck decides he wants to stir the soup instead of Squirrel. A fight ensues and Duck runs away from home. After hours of being worried and looking for their friend, Cat and Squirrel are so happy to find their friend that they allow him to stir. This is a great book to explore the dynamics and flexibility of friendship. The love of reading is contagious! When parents, teachers and caregivers enjoy what they are reading, the enthusiasm of the children listening will most definitely follow suit. Jan Thomas is a longtime favorite author in our household for this very reason. All of her books are fun and interactive reads. It is impossible not to be enticed into acting out the stories along with her characters! Pumpkin Trouble is no exception! Duck finds the perfect pumpkin, but as he has a problem as he carves it and is scooping out the very last seed. He falls into, and gets stuck inside, the pumpkin! Hilarity ensues as Duck’s friends come to think that the walking pumpkin is a monster. Pick a Perfect Pumpkin was a fantastic combination of factual information and story. The format includes characters interacting in dialog through speech balloons as an aside to the body of text on each page. While each page shares information about the season and pumpkins, the main characters are depicted interacting with pumpkins on a farm. We are introduced to a variety of concepts in the book. Some include autumn weather, where pumpkins originate, when pumpkin seeds are planted, that pumpkin is a fruit, and that they come in all shapes, colors and sizes. I especially appreciate that this book can be used to tell a story or to generate conversation. Each builds vocabulary and background knowledge for a range of ages. It would be a fantastic read for a pumpkin unit, story time, or as preparation for a visit to a pumpkin patch. Songs and rhymes have a positive impact on language development. And children love to hear the sound of parents and caregivers singing. This book has an adorable and engaging take on the familiar tune of the Itsy Bitsy Spider which allows the reader to sing along with the adventures of the itsy bitsy pumpkin. An added bonus is this adorable book is a durable board book with bright and colorful illustrations! Opportunities for building vocabulary and background knowledge include words such as: spooky, ghoulish, cornfield, bales, roam, etc. Pumpkin Countdown depicts a class field trip to a pumpkin patch. The children enjoy all the usual amazing opportunities a pumpkin patch can offer—visiting the petting zoo, learning how pumpkins grow, navigating a corn maze, taking a tractor rise and picking a pumpkin. This book is chock-full of mathematical vocabulary and number sense/scientific concepts appropriate for small children. Not only does this book give opportunity for conversations on counting, life cycles of pumpkins, and how bees interact with flowers, but it also models everyday opportunities to use math in a real life setting! From the moment the children leave the school to their departure from the pumpkin patch (including a super cute pumpkin pie counting song), they are finding and recognizing numbers in the world around them. The Runaway Pumpkin is fabulously entertaining book and has to be included on any pumpkin books list! On Halloween day, siblings Buck, Billy and Lil Baxter find their ideal (and very large pumpkin) on the top of a hill. Against the advice of their little sister, Buck and Bill cut the stem and inadvertently send the pumpkin rolling down the hill. It rolls faster and faster, crashing through their farm and creating chaos while also inspiring thoughts of Granny’s pumpkin pie and pumpkin bread in the minds of the other Baxter family members. When they finally manage to capture the runaway pumpkin, the whole family enjoys contributing to carving, baking, and sharing the pumpkin. Not only was the story perfect for the fall season, but it also had great opportunities to share rhyming words and sounds: hill & chill, fine & vine, gleam & seen, faster & disaster, etc. Who doesn’t love Pete the Cat? This re-imagined Five Little Pumpkins is only made all the more “groovy” by the presence of the always cool Pete the Cat! The wording stays the same, and the numerical vocabulary is still valuable, but the illustrations are fresh and fun! This book is super cool and is still a fantastic pairing for the traditional fingerplay. The Five Little Pumpkins fingerplay can be seen here as shared by the lovely ladies from Jbrary. This book was so much fun! It encourages you to use your imagination as outrageously giant pumpkins are featured towering over well-known national landmarks. This beautifully illustrated book not only gives some great background into the various national landmarks it features (at the end of the book), but it also offers text in different sized font and color that can be used as tools for promoting print awareness. By sharing a variety of descriptive words, the language used by Wendell Minor is also rich with scale focused vocabulary such as; gigantic, high, jumbo, immense, mighty, stupendous, astronomical, colossal, etc. What are some of your favorite pumpkin books to read with the kids? Be sure to tell me about any of your favorites that aren’t listed here. Maggie Patrick lives in Arizona with her husband and two small children. Maggie has worked as a literacy expert for over 10 years with the public library. She has also spent two years working in K-6 classrooms. Maggie is a strong advocate of early literacy and childhood development. She enjoys reading, drawing, traveling and spending time with her family. Love ready all your ideas can’t wait to continue to get more each month. Thank you so much, Brianna! This comment makes my day :).